PRINGFIELD, Mass. 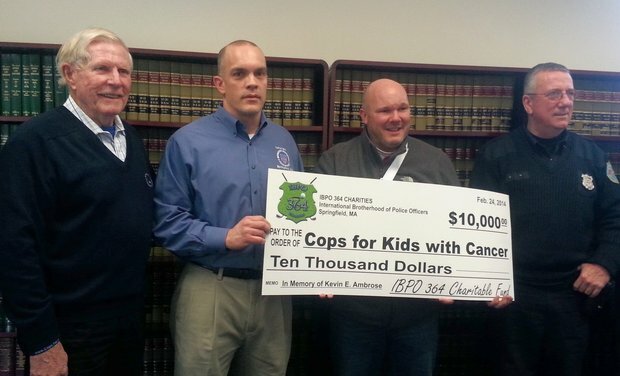 (WGGB) — Springfield’s chapter of the International Brotherhood of Police Officers made a significant donation to the Cops for Kids with Cancer organization Monday. The donation was given in memory of Springfield Police Officer Kevin Ambrose, who was killed in the line of duty in 2012. Cops for Kids with Cancer helps families with financial donations, during their transition dealing with pediatric cancer. From living costs, transportation, and much more, families receive support during a difficult time. “We want to thank the Springfield Police and especially the union for this donation of $10,000. We give families $5,000 each, so to us this represents two families we couldn’t have helped unless we got this check today,” says Robert Faherty, chairman of the board of Cops for Kids with Cancer. Cops for Kids with Cancer has helped 280 families in the last five years. Staffed with only volunteers, the organization began in Massachusetts, but has spread throughout New England, and depends on donations to keep the program going.